As I mentioned yesterday, Kyle’s cousin (and now dear friend of mine) is releasing her 2nd book today! I know how excited I am about her next book being available, so I cannot imagine how she is doing about now! Since I had the privilege of being one of the early readers, I am hoping that I will tell you enough to inspire you to get the book without spoiling the book for you! 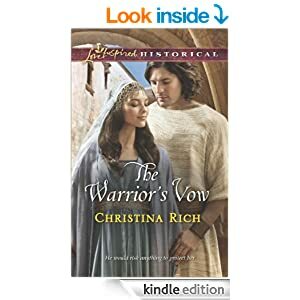 This 2nd book, The Warrior’s Vow, is also available in both paperback and as an e-reader. If I had to sum up this book, the word that comes to mind is truth. The heroine is on quest of truth, especially understanding the details of her background. After all, descending from an evil queen is definitely not an easy background to overcome. She is also desiring to understand the God of the Hebrews. As for the hero, he is on mission to complete his task. He is trying to determine if those who are in his company are really who they say are and if he can trust them. His goal is discerning truth from lies. Most of all, his goal is to be the protector that God has called him to be. I was reminded through the book that I need to put my faith in God first of all. After that, I need to trust those that He has placed in my life to do what they are called to do. God has a path for each of us that He has put in place for us to follow – our roles may not be similar, even if our destination goal is the same. I could see a definite growth in Christina’s writing between her first and second books. Always a great accomplishment as an author! This biblical fiction piece again pointed me to recognizing that God is at work even if how He is orchestrating the details is a bit vague at times. I really needed that reminder right now – thanks, Christina!